First Release Candidate for Geeklog 2.0.0. Please try it out and help us track down any remaining problems. For fresh installs, you may want to go with the latest stable release (1.8.1) instead until 2.0.0 has been officially released. The second BETA release of Geeklog 2.0.0. Please try it out and give us your feedback. For fresh installs, you may want to go with the latest stable release (1.8.1) instead until this version is out of beta. First BETA release of Geeklog 2.0.0. Please try it out and give us your feedback. First BETA release of Geeklog 1.8.0. Please try it out and give us your feedback. Geeklog 1.7.2 is a bugfix update and the last Geeklog version to support PHP 4. Geeklog 1.7.1sr1 is a security update for Geeklog 1.7.1. Geeklog 1.7.1 is a bugfix update for Geeklog 1.7.0. First Release Candidate for Geeklog 1.7.1. Please try it out and give us some feedback! For new sites please download and install Geeklog 1.7.0 instead (until 1.7.1 is out). Geeklog 1.7.0 now supports PostgreSQL (in addition to MySQL and MS SQL), provides re-authentication when the CSRF token expires, and includes various other improvements. This is a complete tarball, to be used for fresh installs and upgrades from all pre-1.7.0 releases. Geeklog 1.6.1sr1 is a security and bugfix update over 1.6.1. This is a complete tarball, to be used for fresh installs and upgrades from all pre-1.6.1 releases. Alternatively, you can also download Geeklog 1.7.0, which was released at the same time. This contains only the file needed to upgrade from Geeklog 1.6.1. For fresh installs and upgrades from earlier versions, please download the complete Geeklog tarball instead. This contains only the file needed to upgrade from Geeklog 1.5.2sr5. For fresh installs and upgrades from earlier versions, please download the complete Geeklog tarball instead. First Release Candidate for Geeklog 1.7.0. Please try it out and give us some feedback! For new sites please download and install Geeklog 1.6.1 instead (until 1.7.0 is out). 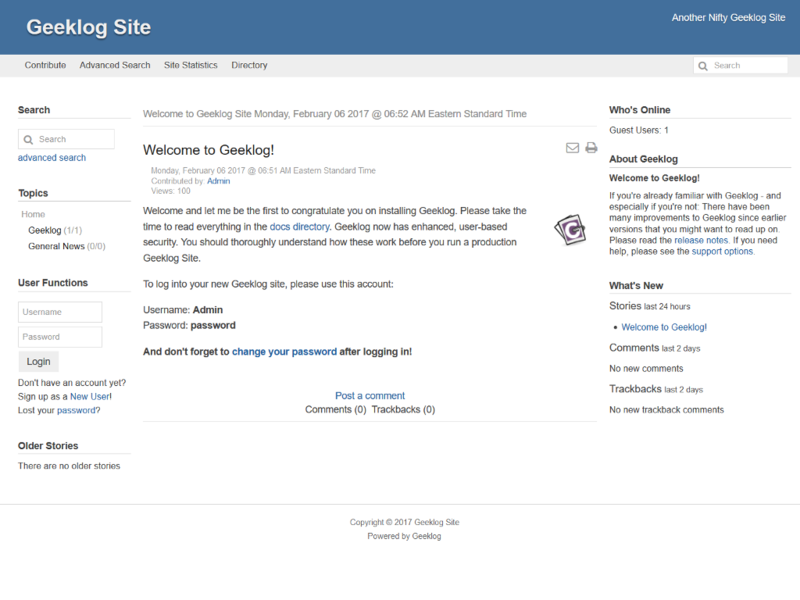 This is the first BETA version of Geeklog 1.7.0. Please try it out and give us some feedback! For new sites please download and install Geeklog 1.6.1 instead (until 1.7.0 is out of beta). Geeklog 1.6.1 is a recommended upgrade for all users of 1.6.0, addressing several bugs while also adding some new features. This is a complete tarball, to be used for fresh installs and upgrades from all pre-1.6.1 releases. This is the first Release Candidate of Geeklog 1.6.1. Please try it out and give us some feedback! For new sites please download and install Geeklog 1.6.0sr2 instead (until 1.6.1 is released). 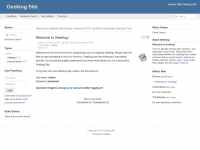 This is the first BETA version of Geeklog 1.6.1. Please try it out and give us some feedback! For new sites please download and install Geeklog 1.6.0sr2 instead (until 1.6.1 is out of beta). Geeklog 1.6.0sr2 is a security and bugfix update over 1.6.0sr1. This is a complete tarball, to be used for fresh installs and upgrades from all pre-1.6.0 releases. This contains only the files needed to upgrade from Geeklog 1.6.0sr1. For fresh installs and upgrades from earlier versions, please download the complete Geeklog tarball instead.